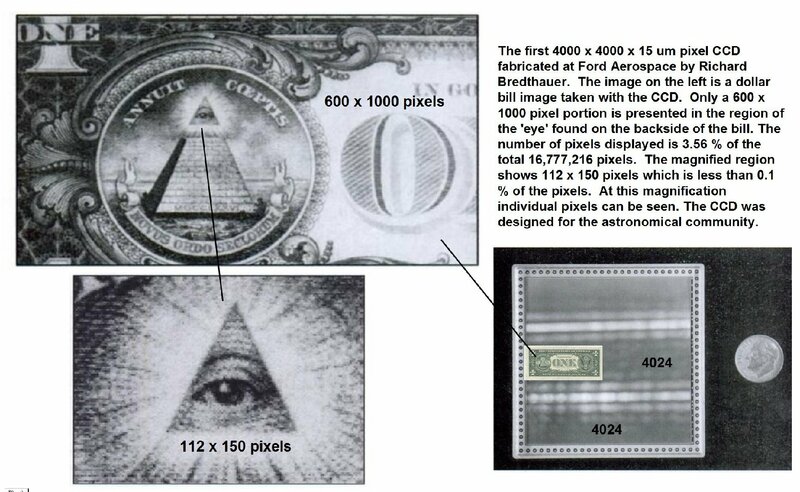 in spacecraft or for medical purposes. 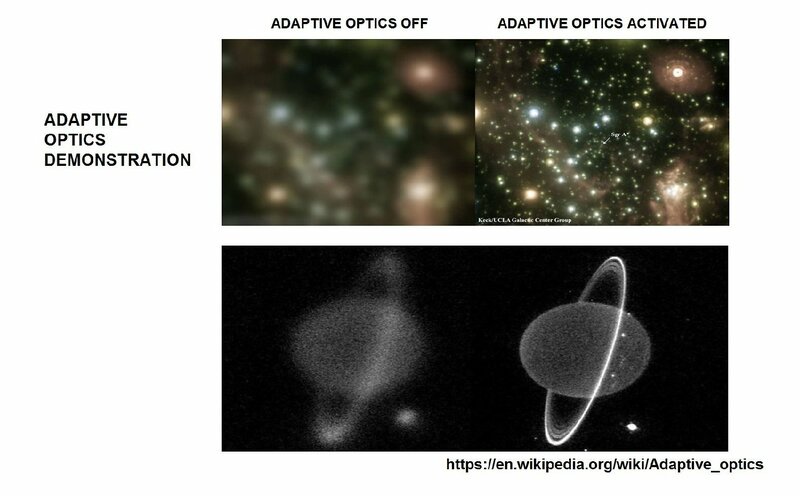 Adaptive optics (AO) is a technology used to improve the performance of optical systems by reducing the effect of wavefront distortions: it aims at correcting the deformations of an incoming wavefront by deforming a mirror in order to compensate for the distortion. Early 1970s. 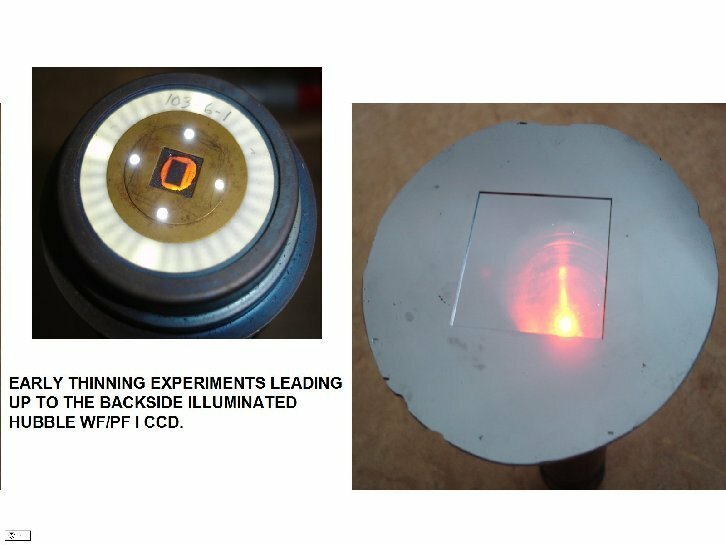 Result of using metals not compatible with thermal rate of glass expansion. 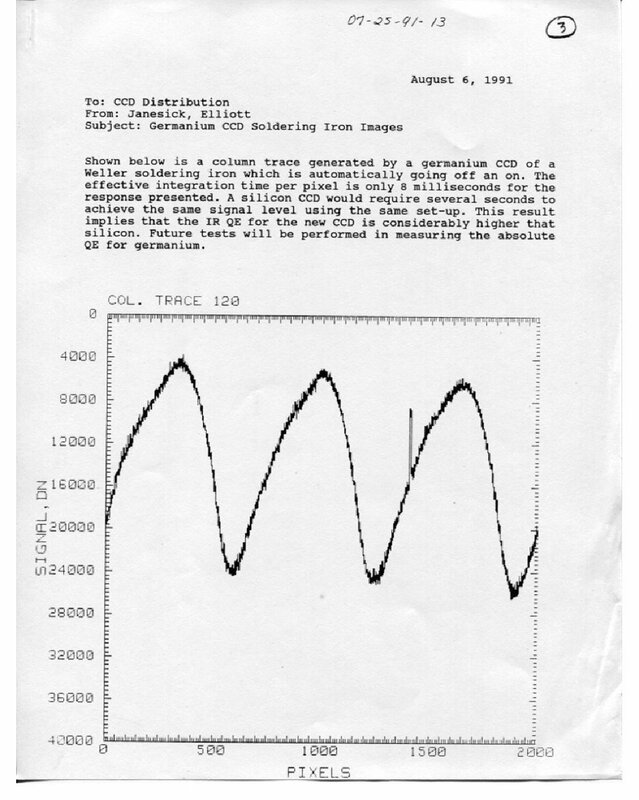 The above CCD was manufactured by RCA as their lfirst attempt to replace TV tubes with a solid state imager. 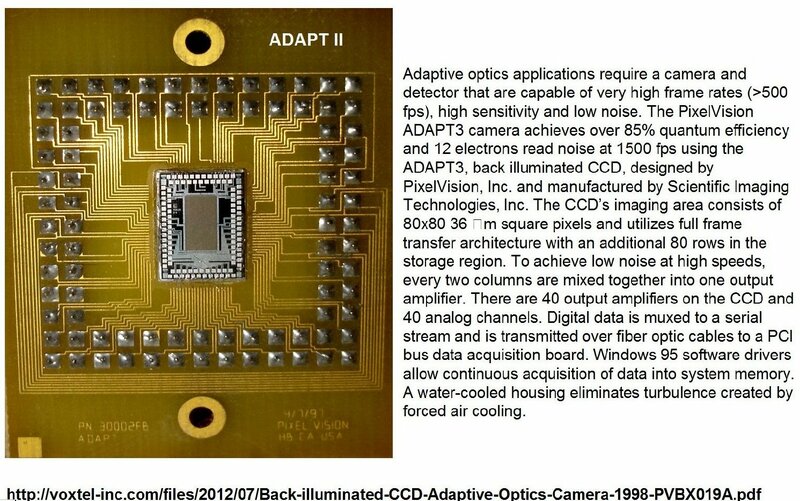 The item on the right is a copper cooling block which held the CCD. 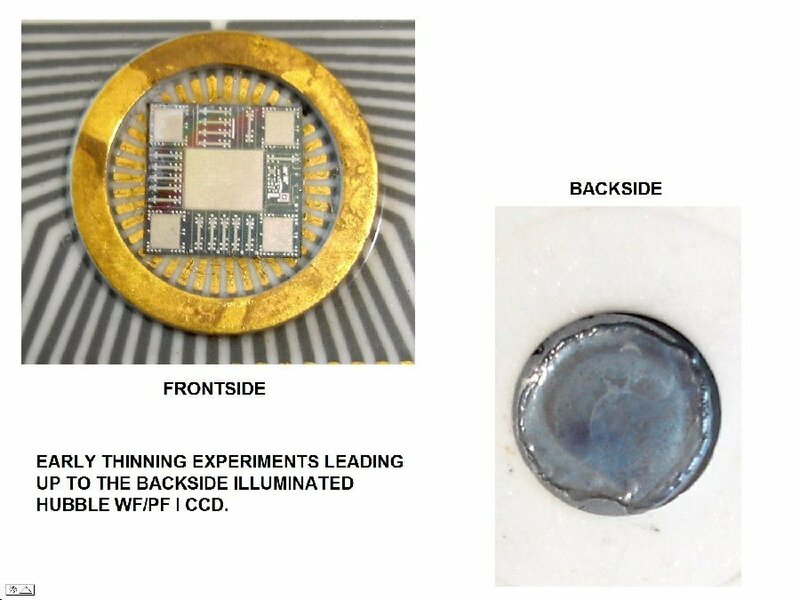 The different expansion rates between the copper and the CCD glass cover while cooling the device to liquid nitrogen temperatures caused the cover to break. 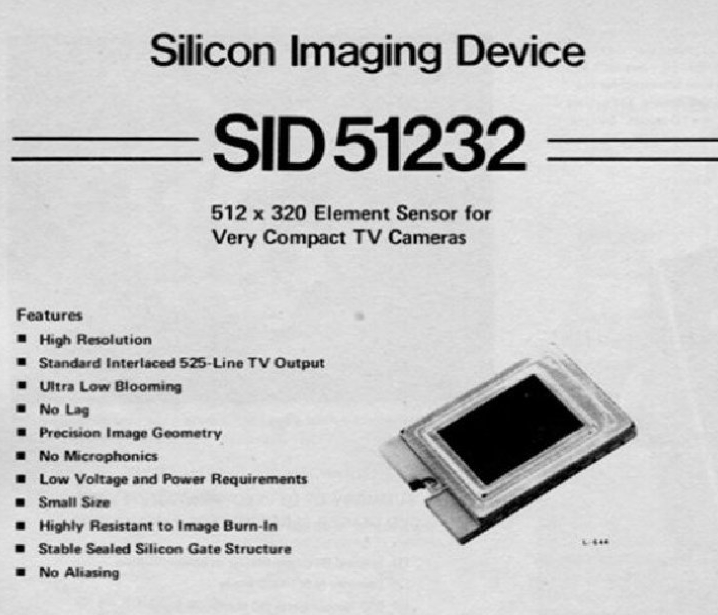 In 1987 work began on the first ever Germanium CCD imagers which were built on 3-inch germanium wafers. 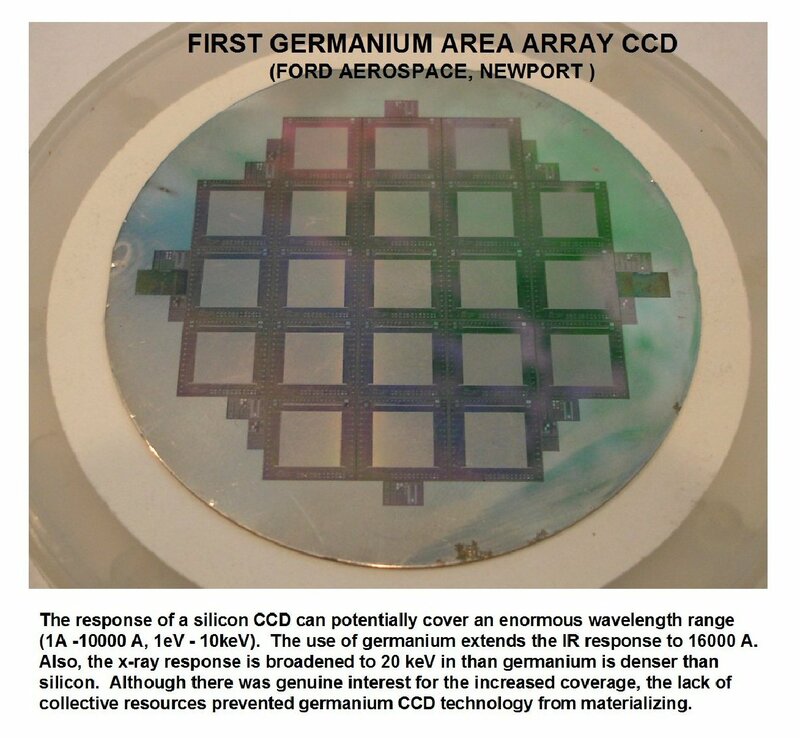 Germanium had the advantage over silicon in broadening the infra red and X-ray response as compared to silicon CCDs, however, technical problems resulted in little demand for this type of CCD and the project was discontinued in 1991 except for testing. 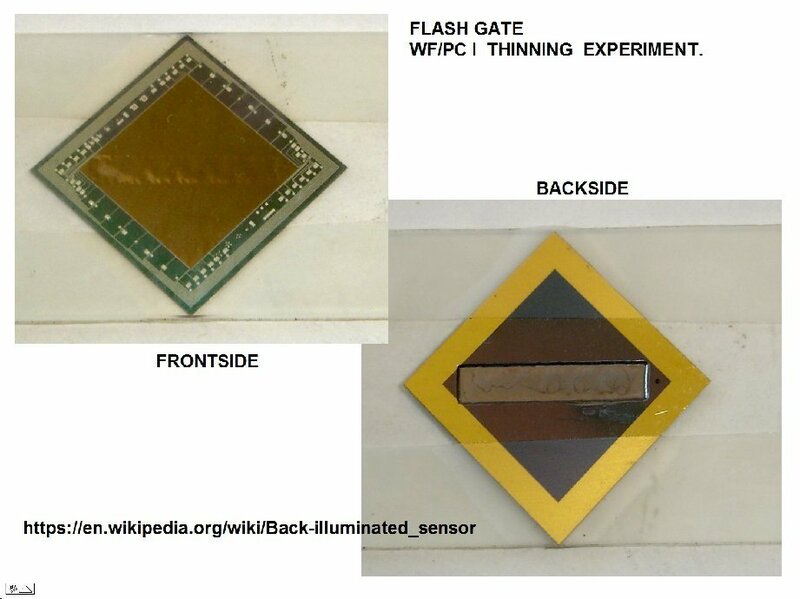 The image on the right shows infra red response of the Germanium CCD which was many times faster than a Silicon CCD, one reason why there was original interest in Germanium as a possible substitue for Silicon. 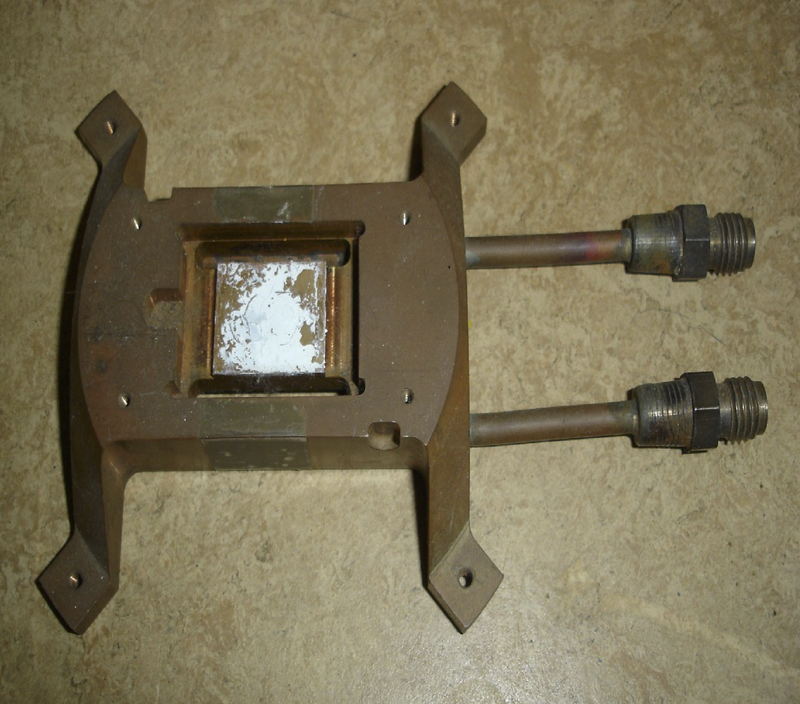 The Germanium CCD was going to be used for a host of applications (e.g., military, astronomical). 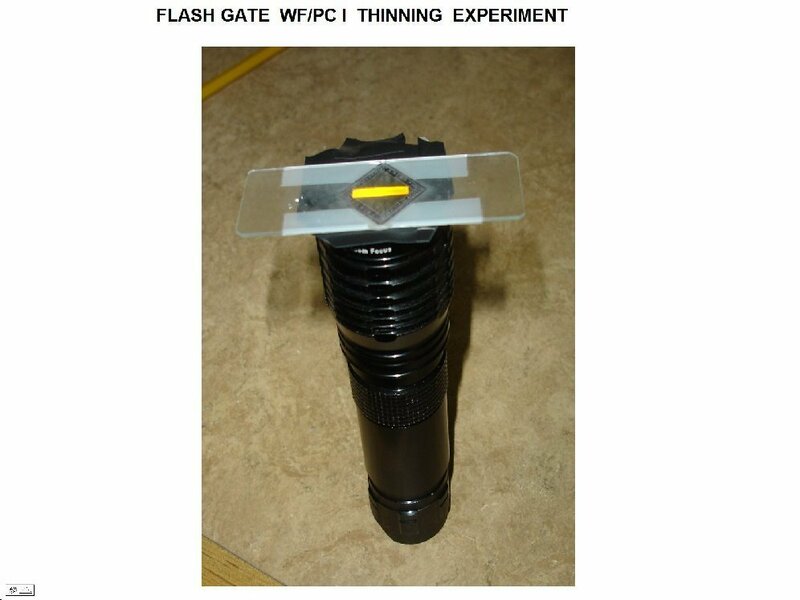 The technology was very very difficult to fabricate into practice. For example, germanium oxide dissolves in water. 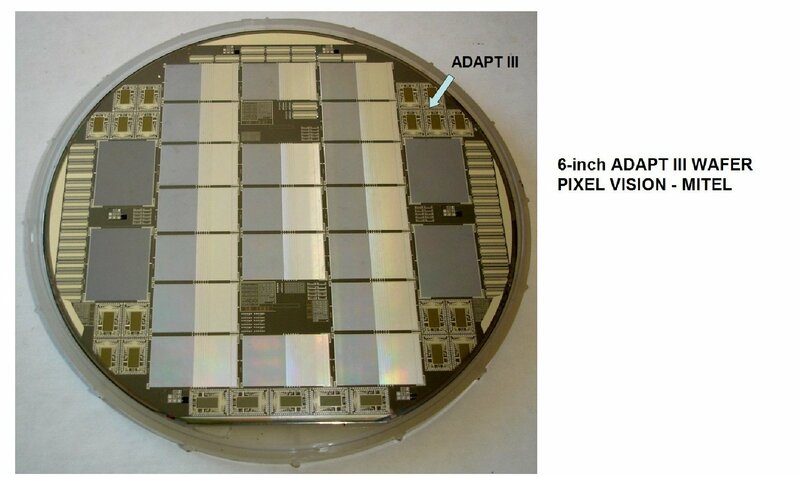 In contrast silicon dioxide (glass) is one of the best insulators there is. 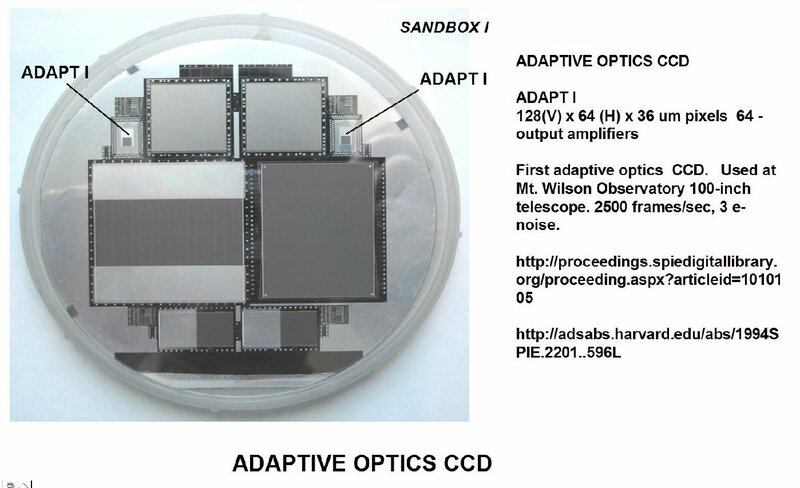 A gate oxide is needed to fabricate a CCD. 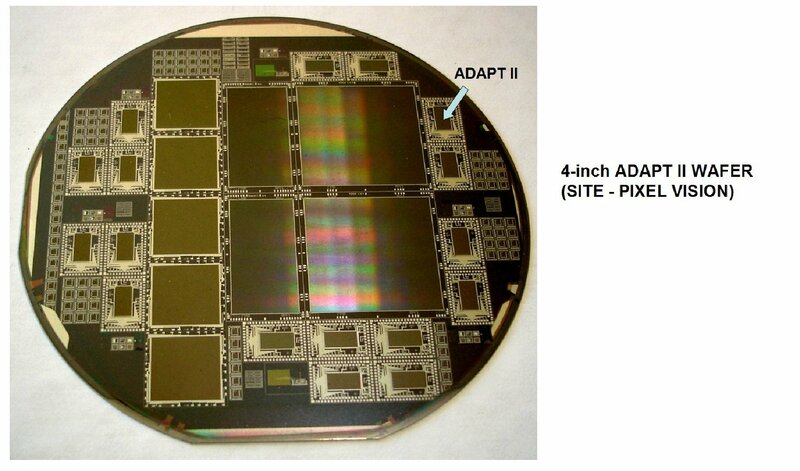 Germanium is limited to 1.6 um (IR) as opposed to 1.0 um for silicon (NIR). The day sky looks black at 1.6 um. 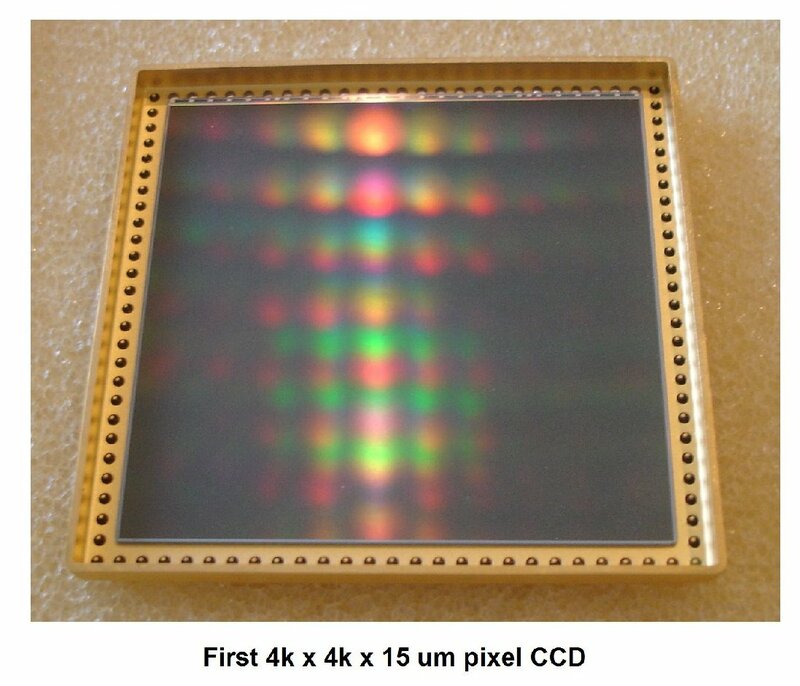 The above Germanium CCD wafer is the only known one in existence and was donated to DigiCamHistory.Com by James Janesick.